Here are the steps we followed with our first baptism meeting. A letter from the school and parish went out to our community. Our school chaplain and principal spoke to the children about the letter and baptism during morning prayer visits to classes. They recorded the names of any children interested in becoming baptised. Our Catholic Character team followed up with phone calls to families. We were also aware that sometimes, children and adults are already baptised in another faith. They can also become Catholic through participation in a Profession of Faith. Prepare a prayer table and some reflective music. Include water and oil, white stole and other symbols. Begin with introductions and a prayer. a shout of praise. Amen. Amen. You are the wind: fill up my sails. You are the water: run fast beneath my keel. God my Friend, oh God my Friend. You are the darkness: embrace me. You are pain: hollow me. You are love: overflow me. and the peace of tranquil waters. and I thank you. Amen. Amen. In emptiness let me find fullness. In imprisonment let me find freedom. Joy Cowley "Aotearoa Psalms" c 1989 Catholic Supplies (N.Z.) Ltd.
- What is the reason for the purpose of the meeting? Let families share their reasons for being there too. -The difference between being baptised and not being baptised. 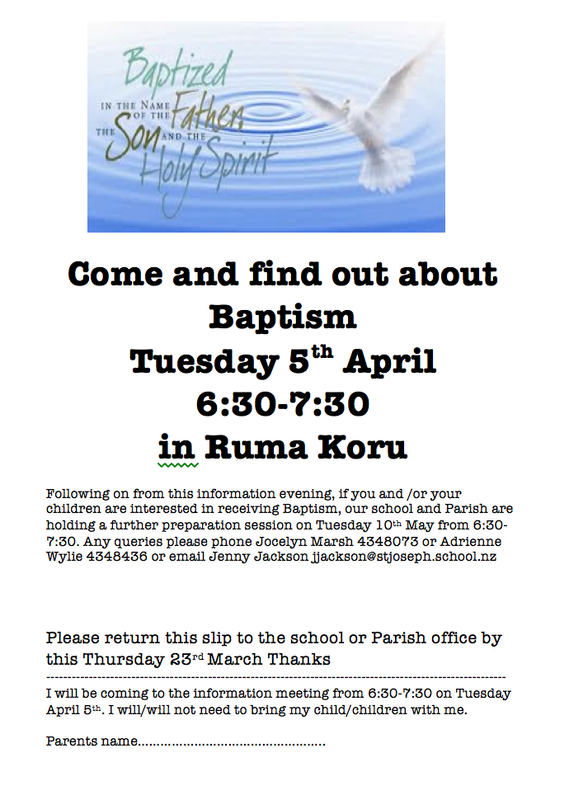 -Share this slideshow of one of our Year 7 boys who chose to be baptised. -What does it look like to be a baptised person ? - Share the video interviews with Sebastian (now Year 8) and Molly (baptised in Yr 6 and now Yr 7). 1. 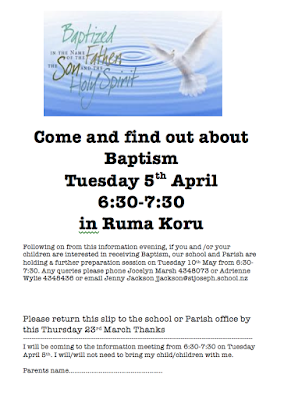 What do you think helped you to decide that you would like to be baptised into our Catholic faith? When I first started at St Joseph’s, I really enjoyed the RE and I wanted to learn more about Jesus and God. I thought that I could learn more, by getting baptised and going through the steps. I talked about it with Mum and Dad and Fr Wayne and everyone was excited for me to be baptised and keep learning. It means that I can be involved in the services, receive communion, have a prayer partner and I am now learning to be an alter server. It brings you closer to God. 2. Explain what part of the baptism with Fr Wayne felt special for you or the most memorable part of the experience. I liked going through this experience in front of the school because the whole school was so supportive and I felt like I belonged to the Catholic Faith. 3. Is there anything else you would like to add yourself ? It teaches you to pray and helps you be a kind person and God and Jesus support you through your journey. -What will becoming baptised mean for us in our lives ? Turn and share. -Sacraments are signs. We are making a conscience decision to join the Catholic Christian community. This becomes an outward sign to journey with Christ and become more Christlike. -Final reflection and brief details about the next meeting. It will involve preparation towards baptism. Ensure you are available to have a cup of tea and talk with the participants after the meeting.